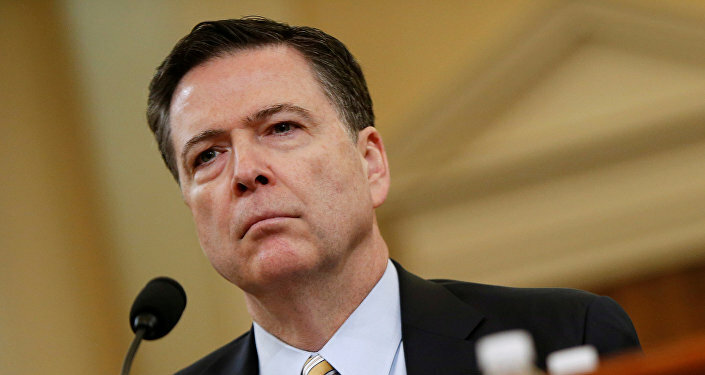 A total of 46 percent of US citizens believe that former Director of Federal Bureau of Investigation (FBI) James Comey is more honest and trustworthy than US President Donald Trump, a poll showed. MOSCOW (Sputnik) — According to the YouGov poll issued on Saturday, only 26 percent of the citizens viewed Trump as trustworthy, while 28 percent said they were not sure. The poll was conducted on June 8-9 and involved 1,000 US citizens. The poll comes following Comey's testimony on the Trump-Russia probe at the US Senate Intelligence Committee on June 8. It was the first public appearance of Comey since his firing in May. During his testimony, Comey explained why he recorded his private talks with the US president, saying that he was afraid Trump might "lie" about them. However, he said that Trump did not directly order him stop investigation into former National Security Advisor Michael Flynn. Following the revelation, Trump's lawyer Marc Kasowitz called for finding out whether by leaking sensitive information the ex-FBI head violated the law. In May, Trump fired Comey over what he believed was poor handling of the investigation into the Hillary Clinton private server and email scandal. However, many believe that the decision is connected with the probe into alleged ties of Trump's campaign team to Russia, as Comey reportedly was seeking funding to extend the bureau’s inquiry. Comey said on Thursday that he believed that not his alleged incompetence, but the Russia probe made Trump decide to fire him. Russia has repeatedly denied claims of meddling in the US political process, calling such allegations absurd. Kremlin spokesman Dmitry Peskov said Moscow had no official contacts with Trump's team during the presidential campaign.